Ohaus VN floor scales are industrial strength, legal for trade and intended for dry use applications, however NEMA 4X/IP65 Stainless Steel Side-Access Junction Box with IP67 load cells limits effect of water on base. Treaded platform provides slip resistance with added stainless steel feet with rubber bottoms attached to each load cell. Ball-in-cap design makes feet self-swiveling and base easier to install. Carbon steel eyebolts are also included to make the installation process easier. Indicator includes backlit LCD display with 1” high digits, lb and kg weighing units, an 80-hour internal rechargeable battery and included AC adapter, counting mode for inventory applications and a wall bracket for easy mounting. 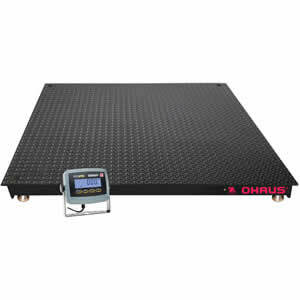 OHAUS VX Series is a portable low-profile floor platform and indicator scale package for use at freight consolidators, forwarders, processing plants, resellers, shipping and receiving departments, as well as startup businesses. 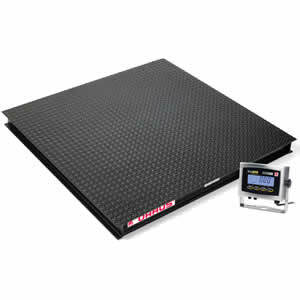 VX floor scales and T31XW indicator each have washdown protection which is necessary in waste management or other industries where liquids will leak onto the scale.